I think I would classify myself as DIY (do-it-yourself) bike owner – the type of motorcycle rider who can at least tackle a good number of basic motorcycle maintenance and repair. 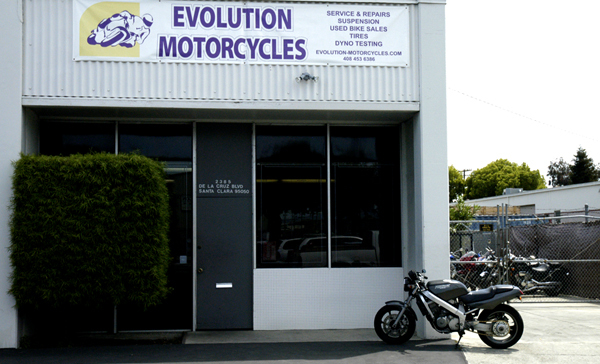 For those jobs though that I can’t or shouldn’t handle, that’s when I take my bikes to Evolution Motorcycles – the only motorcycle full-service shop in Northern California that I ever take my bikes to. Owned and ran by Rob and Jane Sissons, I’ve effectively been a fly-in-the-walls of their shop since I first took my business to them about seven years ago, when Rob took my 1996 Kawasaki ZX7R at a moment’s notice, just before I was due to make my very first trackday on that bike and it wouldn’t start. Rob sorted it then, and he sorted many more of my bikes since. The rest has simply been friendship history. Rob Sissons, owner and head mechanic. While nowhere near Rob’s mechanical aptitude, I’m adept enough to tackle the basic stuff and understand the concept of more complex ones to know when to hand them off to Rob because I either don’t have the time, the (special) tools, or the experience. I’ll admit though, I’m pretty sure there has been a time or two when Rob had to clean up after me and my attempts at working on my own bikes. And so that gave me the idea for this blog entry; what were the most common things they’ve had to deal with from people who attempt to work on their own bikes? So I asked Rob and his two other mechanics, Mike and Steve, and though each of them had to take a minute to think about it, once the floodgates were open, it just kept pouring! They had so much to add, I had to narrow it down to the top choices that all three of them could agree on. Having to correct their mistakes. Having to fix their attempts at correcting their mistakes. Using standard bolts in a metric thread, and vice versa. Mike and Steve – they're professionals, I swear! So there you have it, and please don’t think this as some kind of deterrent to trying bike servicing on your own. Rather, just keep this short list in mind, so maybe the next time you’re trying to do something on your bike by yourself and there’s a voice in your head telling you not to or to stop where you are, that perhaps you'll listen to it. If something feels off, then maybe it is, and maybe that’s when it’s best to take it to a professional. While learning from mistakes can be one of the best ways to learn, there is something you can do about how expensive the lesson ends up costing you. If nothing else, leave with this one little nugget of wisdom: If it doesn’t feel like it fits, don't force it!